Pivotal CRM is a fully featured cloud-hosted CRM designed to integrate, streamline and automate service and support requests with sales opportunities like upselling and cross-selling. It helps sales reps to leverage the most ROI off their prospects, while giving managers visibility across their team’s activities and deals and tools for accurate sales forecasting. The software suits business of any size looking for marketing, salesforce and service automation. The vendor also provides full management service and hosting for on-premise setup. Pivotal CRM is designed on Microsoft .NET architecture and hosted on Amazon Services. It is configurable to the business processes of various industries like manufacturing, service & support, finance & administration and supply chain. Among others, Pivotal CRM fast tracks your sales cycle and increases the potential for repeat sales for more revenues. It also empowers sales teams to follow the most viable and leads and realize for themselves better results, boosting their work morale. From the customer’s perspective, queries or concerns are immediately addressed by your reps and product and services are better matched with customer needs, leading to higher customer satisfaction rating. A separate Pivotal CRM Services, a suite of online technical resources, training and consulting as pre- and post-implementation support to ensure the system is customized to your specific processes. The service also provides training to ensure user adoption and assess the overall system efficiency to your organization on a regular basis. Pivotal CRM shortens your sales cycle, allowing you to meet targets faster. With automated processes that allows for picking the most viable leads, a small sales team can concentrate on quality prospects and optimize its resources, leading to higher conversion rates. Likewise, once individual targets are being met, employee morale is reinforced and, overall, the company becomes even more competitive and profitable. Sales reps can focus on creating more quality deals instead of being bogged down by false leads and admin tasks. With mobile access, reps can also access customer data anywhere and from any internet-enabled device. Pivotal CRM also makes it easy to personalize your sales strategy. It unearths customer needs, interests and concerns, allowing your reps to address them with pinpoint accuracy. For the B2B industry, the system helps you build closer and long-term relationship with clients leveraging transparency, accuracy and actionable insights. 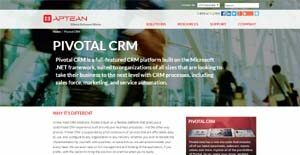 A derivative benefit with Pivotal CRM is that it is part of the Aptean suite of CRM solutions. Should you need to scale or add more functionalities, it is easy to natively integrate Pivotal CRM. Aptean also offers an extensive knowledge management system and IT helpdesk, plus its acquired Onyx CRM software. Since each enterprise has particular business requirements, it is sensible for them to refrain from searching for a one-size-fits-all ideal software application. Needless to say, it would be pointless to try to find such an app even among market-leading software applications. The smart thing to do would be to jot down the various essential elements that require consideration such as key features, finances, skill levels of employees, company size etc. Then, you should do your groundwork thoroughly. Read some Pivotal CRM reviews and check out each of the other systems in your shortlist in detail. Such comprehensive research can make sure you weed out ill-fitting applications and select the system that provides all the aspects you need for business success. How Much Does Pivotal CRM Cost? Pivotal CRM pricing is available by quote only. Contact the vendor. We realize that when you make a decision to buy CRM Software it’s important not only to see how experts evaluate it in their reviews, but also to find out if the real people and companies that buy it are actually satisfied with the product. That’s why we’ve created our behavior-based Customer Satisfaction Algorithm™ that gathers customer reviews, comments and Pivotal CRM reviews across a wide range of social media sites. The data is then presented in an easy to digest form showing how many people had positive and negative experience with Pivotal CRM. With that information at hand you should be equipped to make an informed buying decision that you won’t regret. What are Pivotal CRM pricing details? What integrations are available for Pivotal CRM? Likewise, Pivotal CRM has an extensive API library that can be configured to integrate with almost any CRM system to streamline setup costs. The API also allows for integration of the CRM’s user details, case background, process linkage, email response synchronization, SSO and other standard CRM data fields.